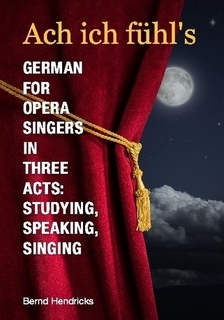 Ach ich fühl’s – German for Opera Singers in Three Acts: Studying, Speaking, Singing is the first German language book that makes you laugh – not from desperation but because you are having fun. This quick, lighthearted guide to German immerses you – singers, vocal students and vocal teachers – in one of the most important languages of your art. At the end, you will not only understand German for opera singers, you will feel it, too. You will build your grammar knowledge and your vocabulary through the ordeals and triumphs of the most intriguing characters in opera. You will learn to navigate German within the daily routine of a German-language opera house and the world outside, guided by texts of graduated lengths and increasing complexity. You will study 10 arias, crucial preparation for auditions. With the help of a new translation and linguistic interpretations, you will achieve a deeper understanding of these arias. This book will help you to be successful in the increasingly competitive world of opera. Available at lulu.com, amazon.com and bookstores. 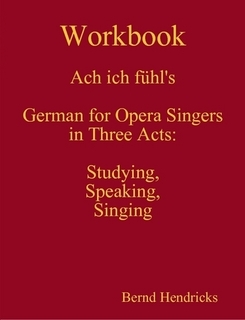 This workbook complements Ach ich fühl’s – German for opera Singers. The grammar and vocabulary exercises are based on arias, plots, and the biographies of singers and composers. You will study the dative case with “Lohengrin” or the future tense with “Zauberflöte,” learn to count the numbers with a call from a booking agent or to build the relative clause using your own goals and ambitions for singing in Europe. Finally, you will practice prepositions according to the directions of an imagined opera director. The answer key at the end of the workbook will tell you what you did right and what you have to improve. I am a Berlin-based language teacher and writer. For many years, I have been teaching singers who aspire to perform and live in Germany, Austria and Switzerland. I would like to call myself a self-made man; I began my career as a telephone worker and was formed by life, letters and languages. I had my first and everlasting opera experience as a child in the lap of my grandmother watching Humperdinck’s “Hänsel und Gretel” in the city opera of Duisburg am Rhein. From the early 1980s I worked as a reporter for German newspapers and radio stations until I discovered New York. For 15 years, until 2010, I lived and worked in New York as correspondent for German magazines. Here, I met many people who were interested in the German language, mostly opera singers, stage hands, music teachers, and stage directors. When I returned to Germany in 2010, I began working on this book. Now, I am presenting it to you as homage to your art. I am the author of two novels, “Menschen mit Flagge” and “Illegal.” Ach ich fühl’s – German for Opera Singers is the first book I have written in English. So interested to read the book. I was wandering what arias does the book cover if you please let me know.